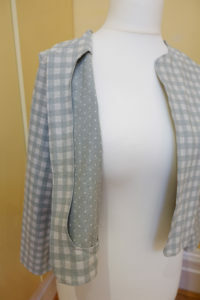 This is my first make for the lovely people at Simple Sew patterns and I chose the fab Jackie O Jacket. Click here to have a look or buy the pattern Jackie O Jacket Pattern I initially chose it as I had bought some amazing 2 sided printed linen from Japan via Ebay and really liked the idea of using it for this pattern as the jacket is unlined and I thought it would be fun for it to have a different inside pattern. I loved the fact that the pattern was printed on ‘normal’ paper not tissue, as I cut the largest size of the pattern, then trace off the size I am going to use and somehow no matter how careful I am the tissue ones never last as long. 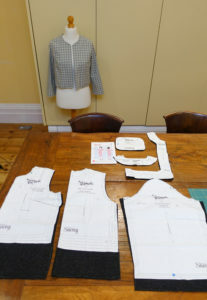 The Instructions and diagrams were clear, which was a relief as some companies pattern instructions are not and rely on you having a lot of existing knowledge and experience of garment making. Ta da! 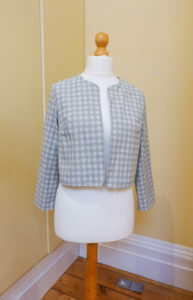 here it is on, a light weight jacket ideal for spring and summer. Good alternative to a cardigan. I liked it so much I decided to make another one, this time I wanted to make a more formal more so pattern hacked it to make it longer. The fabric was from the utterly wonderful ABAKHAN I chose a boiled wool in charcoal, however i realised that it was going to need to be lined as the wool was brilliant for the jacket but a bit itchy for me to wear if I wasn’t wearing any sleeves under it. For the lining I chose a lovely silky bird print from one of my favourite local fabric stores Fabrics Galore The print design reminded me of Ted Baker prints and I wanted the lining to have a bit of a colour pop about it, and this fabric was just right. A slight aside here, but I have a bit of thing about Zero Waste. So when I cut out a garment, I try I see how close I can get to either zero waste or what I could also cut from the remaining left over fabric. 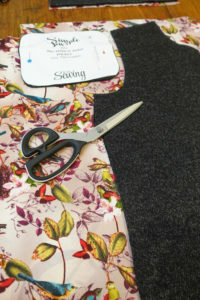 This time I decided to cut a matching jacket for my Little One who is 4yrs old. You can see her bodice ‘block’ in this photo (its the blue/green shape). I am happy to say I did manage to have enough fabric over to cut her a jacket. When I have made it up I will post some photos of it. 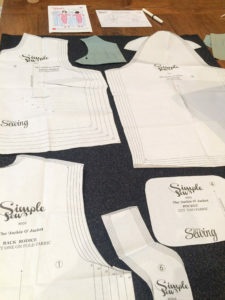 To make the lining, I tired the bagging out method, without the facing. I wouldn’t recommend this and when I make the Jacket again I would cut the lining by tracing off the body, less the facing, then stitching the 2 together. This way I would get a more professional look, but I thought my way was going to look good and be quick, I was wrong on both counts! 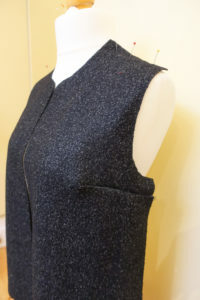 I finished it with a fine black trim around the sleeves, neck, bodice front and hem line. 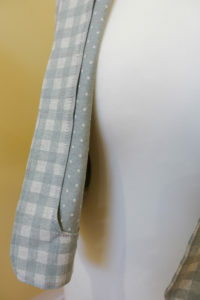 I am really happy with this version and will be making another Jackie O Jacket in the future. I came across this beautiful pattern in my pattern stash whilst tiding up my sewing space to turn it back into a dinning room for the Christmas holidays. Its on my list to make for 2017 but I am going to have to hunt high and low for the right fabric…I can feel another fabric shopping session on its way! I can’t believe that its taken me so long to go to Berwick Street! I think what surprised me was that fact that the shops were specialising in different fabric which made it easier to buy what I needed…in fact very easy to buy. 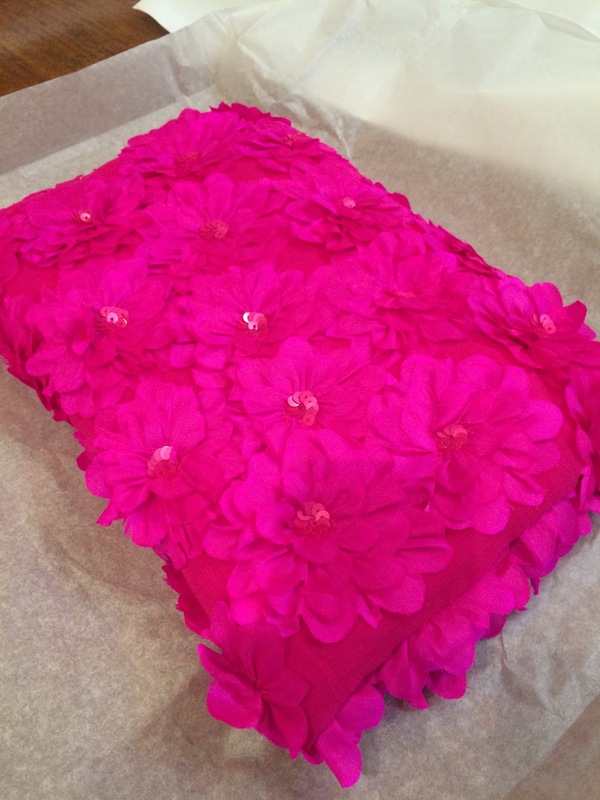 I was very restrained and only bought this beautiful silk that has hand made flower. I have not idea what to make with it any suggestions, I have just over a meter? Cushion, hand bag or cami top?